The term birth trauma applies when a child has suffered a physical injury, including damage to the brain, during birth. A mishandled delivery can leave a child with visible or invisible injuries, from disfigurement and learning disabilities to irreversible conditions such as cerebral palsy. Long-term side effects of a birth trauma may be evident immediately, or they may not appear weeks, months, or even years after the birth injury has occurred. Birth trauma can happen at the hands of inexperienced, incompetent, or distracted medical staff. Poor or rushed decisions during birth, the improper use of equipment, and even impatience all have the potential to lead to trauma in the delivery room. Positioning of the infant. Birth injuries can occur when a child is improperly positioned to descend into the birth canal. In most cases, this undesirable positioning – whether breech, head-up, or buttocks-first – should be recognized and addressed by the attending obstetrician during prenatal care and before the situation becomes dire in the delivery room. Improper use of equipment: When a child is being delivered vaginally but is breech or in another undesirable position, the decision may be made to use forceps or a vacuum. These steps can be carried out incorrectly, resulting in physical injury to the child or oxygen deprivation. Size of the baby: Larger-than-average babies, particularly those that are bigger than their mother’s pelvic area, require special consideration before delivery. Quality prenatal care allows obstetricians to gauge a baby’s size and determine whether early delivery or cesarean delivery is appropriate to reduce injury to child or mother. If this call is not made before delivery because of substandard care, neonatal injuries during delivery can occur. Excessive physical force: The skeletons of newborns are pliable, allowing for passage through the birth canal. However, this physical characteristic does not mean an infant cannot be injured during delivery. A doctor who delivers a baby using too much physical force can injure the child – fracturing of the clavicle is the most common fracture during delivery – requiring extensive repairs or therapy. The infant could also be permanently damaged, creating for them and their family a lifetime of medical needs. Difficult or prolonged labor: Prolonged and arrested labor can be dangerous not only for the infant but the mother. When a mother is stuck in one birth stage for too long, there is an increase in the risk of infection, birth injury, and even death. Some medical tools will be used to speed up delivery – used improperly, they can create dire consequences. Waiting too long to perform a c-section can create fetal distress and brain damage. Labor-inducing drugs may not be effective and could negatively affect baby’s oxygen levels and heart rate. Premature delivery: Babies born before the 37th week of pregnancy are at a greater risk for serious consequences, though the earlier they are delivered increases the direness of the situation. So many important developments happen in the womb in the last weeks of pregnancy. Babies delivered from 23 to 26 weeks can survive, they are at an extremely high risk of respiratory, digestive, or vision problems, as well as learning disabilities, neurological deficits, developmental delays, and cerebral palsy. Injury to your child during birth can lead to irreversible, lifelong conditions such as hypoxic ischemic encephalopathy (HIE), cerebral palsy, Erb’s palsy, and brain bleeds. Bruising, broken bones, fractures, oxygen deprivation, brachial plexus injury, Bell’s palsy, and more. 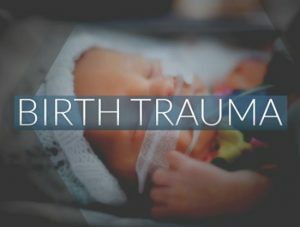 Not every birth trauma happens to the infant. There are some mothers who experience horrific moments in the labor and delivery room. Some are on the receiving end of comments from a disrespectful doctor or nurse. Other mothers feel forced or coerced into delivery decisions they were otherwise against, such as getting an epidural or resorting to a C-section. Some mothers find themselves suffering from post-traumatic stress disorder (PTSD) after delivery. Doctors and hospitals that fear medical malpractice charges may forge ahead with medical interventions that, perhaps, are not yet necessary, like a Cesarean section. These decisions can ruin birth experiences that could have progressed normally given the chance and traumatize mothers in the process. If their child is injured during delivery as well, the damage is twofold and difficult to overcome. The birth of every infant is not always a time of joy. Birth trauma is a heinous and preventable occurrence. If a birth trauma has impacted you or your child, a medical malpractice case may be the right choice. If you believe that negligence, carelessness, or substandard medical attention is the cause of your child’s birth trauma, call Thurswell Law today for a free consultation. We are an experienced family of attorneys who can offer you the best chance at receiving full monetary compensation. We don’t charge any fees unless you collect. Call (248) 354-2222 today to schedule your free consultation.